If you caught my last couple videos you’ll know that I am a big fan of collaboration. You will have heard me talk about the benefits and pluses of working in partnership with others to achieve your impact goals. In this video I want to talk about… the dark side. When things go wrong. When your expectations for rainbows turn into rainclouds and you wish you never entered into a collaboration with someone. I’ve definitely had some collaborations that have gone terribly wrong. And I think it’s important to remember that you can’t expect every potential collaborator to be a good fit for you, or a good fit you at that time. And even if you THINK you found the perfect partner – things can still go wrong. So I’m not saying if follow a certain set of steps everything will always go right. But again, the idea is to build our skills in this area, keep practicing and learning as well go. That said – there ARE some major pitfalls that come up in collaborations. So I want to tell you a bit about one of my past collaborations that really fell apart, and why. A few summers ago I was presented with what seemed like an amazing opportunity at the time. It came up through a friend of mine who put me in touch with a local charity that was interested in hosting an in-person social entrepreneurship workshop series. I highly respect him and was excited for the introduction. In the end, there was certainly no major damage done to my life or my business, but it was a trying experience for me, and in the end it did not feel worth it. A few things went wrong along the way. First – We had no formal agreement in place. This is a major pitfall to be aware off, especially when entering into a collaboration for the very time with someone. We agreed to share the risk and reward of offering the workshop series, and so any surplus revenues after costs would be split between myself and the organization. However, I didn’t have any control over the budget. The venue was already picked, and after all was said and done, the leadership at the time did not provide me with a breakdown of costs and revenues! At that point I was tired of the entire thing and according to my own estimates it was a breakeven endeavour – so I did’t bother further pursuing it. So best case scenario, draw up a formal agreement, even if it’s a simple MOU, and then hold your partners accountable to follow through. And from your side, remain transparent with any accounting and share the details with your partner so that all loose ends are accounted for and the final results of the project are clear to everyone. Second – I realized part way into the collaboration that our goals were misaligned. This is another one of our top 10 collaboration pitfalls to watch out for. I had understood the organization I was working with was interested in rolling out this workshop series as a social enterprise even stream. They had expertise on the board who specialized in social entrepreneurship so I knew they were open to this idea. However, it became clear that this series was not a major piece of the strategic plan for moving the organization forward. It felt like a bit of a side-passion project for the board member who I was working with. And of course there is nothing wrong with that, but because of this, generating a surplus on the series was not actually high on the list of objectives. My co-facilitator was on the board and was already volunteering their time, and without it being a priority for the organization, filled seats at the target revenue goal was not top of mind. That hit home when they offered a spot for free to a participant who was more than willing to pay (our very reasonable charge). Of course they were happy to participate for free, who can blame them! But I realized I was esentially in a situation of volunteering my time at that point as well. Third – The final major pitfall I’ll speak to is clashing work-styles. 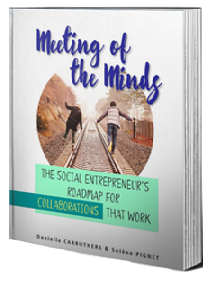 The initial discussion for how we could work together was made with one individual over coffee – but in the end I wasn’t even working with them! All of the workshops were developed and co-taught with another individual in the organization. For this reason I had no sense of how my work style would match up with my co-facilitator! We also jumped right into a 5 workshop series, without testing out the collaboration with a smaller project first. Had I been more aware of this pitfall before starting, I would have certainly navigated the opportunity differently! Ok – enough of that! In contrast, here are the top reasons why my partnership with Solène works so well, and how we have managed to avoid these pitfalls. Our individual visions were aligned before we even started – so there was no misalignment of goals going forward. We also have very complementary work styles – which you don’t discover until you work with someone, which is why we recommend starting with a small scale, one time collaboration when getting to know a new partners. Then you can grow from there. What potential partnership opportunities are you exploring right now and how can you take steps to avoid some of the major pitfalls I spoke about in this video? What steps will you take to ensure you have a formalized agreement in place, that is understood and upheld by everyone involved? And finally, have you worked with them before? Do you know if your work styles will complement each other? If not, think about how you could set up a smaller test project together before jumping into anything so big, so you can be sure you enjoy working together. Best of luck with your collaborations and keep up the good work!!! !